This site is dedicated to the re-discovery of the English gunmaker, W. R. Leeson of Ashford, Kent and London. It is hoped to trace and record some of the lost history of this maker and perhaps go some way to understanding more about his guns. W. R. Leeson ceased trading around late 1933 but a few of his guns have survived and remain in active use today. Whether sold privately or through the auction houses, they still demand good prices, impressive for a provincial maker. Somebody asked me 'Why your interest in W. R. Leeson' ? Some years ago I acquired a W. R. Leeson 12-bore boxlock ejector in its original makers cases. The gun was a wreck having spent many years in a cellar awaiting very major refurbishment. The barrels were red with rust, the stock looked like a piece of fire wood and the action was also is an appalling state. Having tracked down a well established and highly skilled gunsmith the wreck was dispatched off for re-build. Almost eight months later the gun was returned in what can only be described as "beautiful" but lovingly restored condition. The original Siemens steel barrels had been returned to almost new condition and passed nitro proofing, the action rebuilt and tightened, the stock polished and wonderfully restored. Even the case had been overhauled, complete with its original cleaning rods. Spending time examining the shotgun more closely I began to wonder who W. R. Leeson was, I was not aware of the maker, its history or whether the firm even still existed. This set me on the quest to find out more, little seemed to be available via the web or in written publications, then after corresponding with the late Geoffrey Boothroyd and others I was fortunate to obtain some very interesting information about this maker. 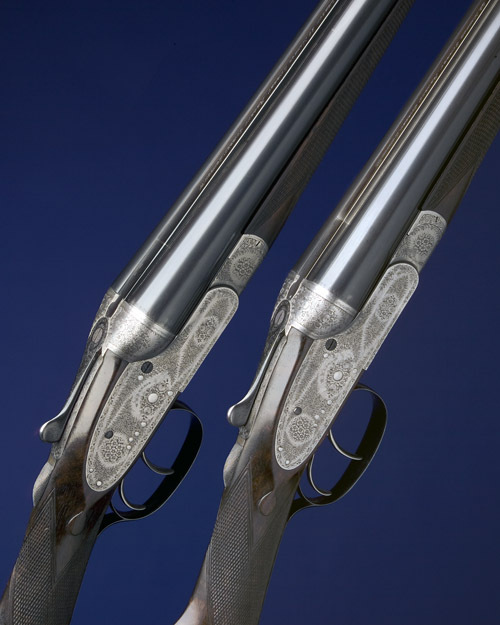 Further research on the web convinced me a few owners or likeminded people might also be looking for information about this fine English gunmaker and that maybe a website dedicated to recording information and photographs might prove useful. Can you help with my research ? Do you own a W R Leeson gun of any type? Are you considering selling a W R Leeson gun or artefacts. If so please do make contact I would consider purchasing from you regardless of condition.